All Moseley Architects employees are encouraged to power down their office equipment every night, and on Earth Day (April 22) each year the IT Department makes a special effort to remind us of this energy-saving practice. At our headquarters building in Richmond, energy use is tracked on a daily basis by system type (HVAC, lighting, and plug loads). This allows us to see just how much the effort pays off. This year Earth Day fell on a Friday, and employees were reminded to shut down computers, task lamps, printers, and other desk gadgets before leaving for the weekend. 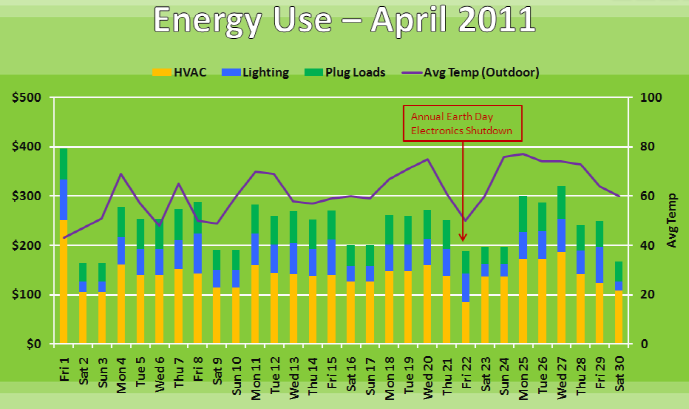 On average in 2011, we spend $43 each weekend day on plug loads in our headquarters building. However over the April 23-24 weekend, we spent just $34 per day. Therefore if everyone made that same effort every weekend, over the course of a year we could save about $900. This experiment has been conducted for the past three years, and each year we calculate that about $3,000 could be saved annually if everyone made the extra shutdown effort every night. The IT Department has made it easy to power up your computer remotely in case you do need to log in at night/over the weekend, and also to automatically turn on your computer every morning so that the startup process is complete by the time you get in to the office. Please help save us energy and money by shutting down every night. There is also an option to auto-turn on your computer every morning. Unfortunately, the search function is broken on the Intranet so I can’t find the link. IT says that they need to help set that up on individual computers, so just ask them if you’d like the auto-on feature enabled.